Is the Middle East "Freer, More Hopeful, and More Promising"? In a Middle East valedictory speech today, summing up the nearly eight years of his two administrations, George W. Bush declared that "the Middle East in 2008 is a freer, more hopeful, and more promising place than it was in 2001." 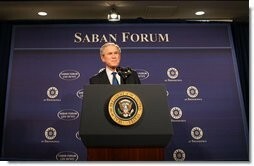 George W. Bush delivering his swan song on the Middle East. Iran is closer to nuclear weapons, perhaps the single most alarming development of Bush's era. Pakistan is close to becoming a nuclear-armed, Islamist rogue state. The price of oil reached all time highs and only collapsed in recent months due to a U.S.-led recession. Turkey has gone from being a stalwart ally to the most anti-American country in the world. The doctrine of preemption has been discredited. Arab rejectionism of Israel has spread. Democracy efforts in Egypt have collapsed. Hizbullah grows in power in Lebanon. Hamas took power in Gaza and may next control the West Bank. The Taliban may again run Afghanistan. And Iraq? Bush made an almost direct reply to my appeal since 2003 to place a "democratically-minded strongman" in power in Baghdad, stating that "when Saddam's regime fell, we refused to take the easy option and install a friendly strongman in his place." Bush remains convinced he did the right thing, I remain convinced that the Iraq story will end badly for the United States.